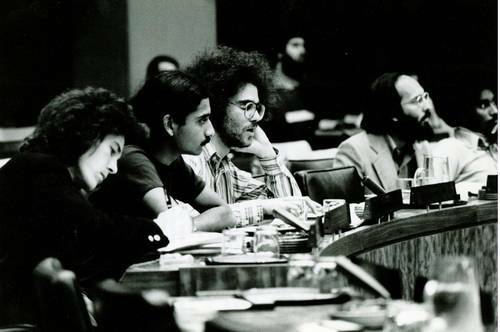 The Special Committee Against Apartheid met to consult with student groups at U.S. universities and colleges which are engaged in campaigns for divestment from corporations involved in apartheid South Africa. Pictured here is Karl Seidman, South Africa Support Committee, Amherst College making a statement. To his left is Larry Litvak of South Africa Catalyst Project, Stanford University. Statements were made by student representatives of the People's Front for the Liberation of Southern Africa, Princeton University; Committee Against Investment in South Africa, Columbia University; Action Committee on South Africa, University of Chicago; Political Committee, Black Student Union, Hunter College; African Affairs Association, University of Connecticut; Coalition for Social Responsibility, Vassar College; Southern Africa Action Group, Wesleyan University; Anti-Apartheid Coalition, Yale University; Northeast Coalition for the Liberation of Southern Africa, Hampshire College; Atlanta University Center; Medgar Evers College; Swarthmore College; and the Department of Black Studies, City College of New York.